Fig. 1: Map of Turkey and Eastern Mediterranean with the Bay of İskenderun region highlighted in red. Two New Testament verses, Acts 15:23 and 15:41, provide tantalizing clues regarding Cilicia’s centrality in the development of the Christian church. Located on the southeastern edge of Cilicia, the Bay of İskenderun served as the geographical link connecting Cilicia Pedias (Asia Minor) with Christian Antioch-on-the-Orontes (Syria), a major regional metropolis during the Roman and Byzantine periods. Due to the paucity of written sources pertaining settlements in the Issos, İskenderun, and Arsuz plains, the Bay of İskenderun archaeological survey is providing essential primary data for reconstructing Byzantine-period occupation in this region. Reconstructing these human and environmental landscapes of early Christian Cilicia is the focus of this study, funded by Dumbarton Oaks. This grant assisted in (1) the completion of the documentation of landscapes and rural settlements associated with three major Byzantine centers in southeastern Cilicia: Epiphanea, Alexandreia kat’Isson and Rhosos; (2) the processing and study of the artifacts associated with these sites; and (3) the analysis of settlement patterns resulting from our survey utilizing Geographic Information System (GIS) software and satellite imagery, considered together with historical sources and travelers’ accounts. 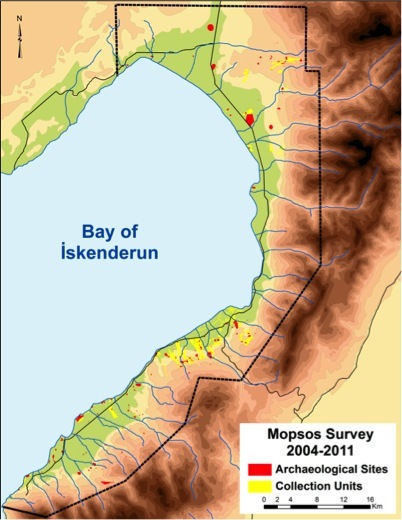 Fieldwork conducted by the Mopsos Landscape Archaeology Project in the Bay of İskenderun represents the first modern systematic pedestrian survey and analysis of the archaeological landscape.This largely unexplored region, located at the nexus between Anatolia, the Mediterranean, and the ancient Near East, has throughout its history served as a cultural crossroads. 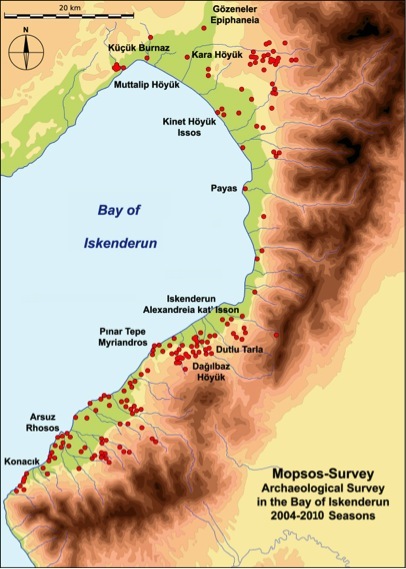 The Mopsos Landscape Archaeology Project documented nearly 200 archaeological sites (map of documented sites), of which the majority were previously unknown. Many of these sites were discovered during targeted intensive pedestrian transect surveys of representative landscapes in the region (map of sites and intensively surveyed regions). All surveyed sites were described and recorded using GIS, which enabled us to incorporate detailed information relating to topography, hydrology, geology, and soils into the analysis of site locations by archaeological period. Rapid industrial development together with expanding modern settlements, tourism, and intensive agriculture have resulted in the disappearance or damage of countless archaeological sites and a marked increase in the incidence of antiquities looting, making this a highly endangered archaeological region (see, for example, the Byzantine-period site 165). According to data collected during our survey, settlement patterns of Cilicia underwent a remarkable change following Alexander the Great’s conquest of the region. Settlements nearly tripled in number, rising from 38 during the Iron Age and Persian periods, to nearly 100 by the first century BCE. Over the course of this project, we identified and documented the three major Hellenistic, Roman, and Byzantine centers in our survey region. These include the site of Epiphaneia (modern Gözeneler), located in the Issos Plain; the site of Alexandreia kat’Isson (Alexandrette), located in İskenderun Plain, within the boundaries of the modern city of İskenderun; and Rhosos (Rhosopolis), the port city of the Arsuz Plain. Our survey has also documented dozens of small contemporary installations, farmhouses, and villages that populated the hinterlands surrounding these key settlements, and which dated mainly to the Byzantine period. Fig. 6: Plan and satellite image of Epiphaneia (Modern Gözeneler). Top: Development of Epiphaneia from the Late Bronze (Red) through Byzantine (Blue) periods. Bottom: Satellite image of Epiphaneia with surveyed structures. Epiphaneia (map), first settled in the second millennium BCE, developed into a major urban center during the Roman and Byzantine periods. Originally known as Oeniandos, the site was renamed in honor of the Seleucid Emperor Antiochus IV Epiphanes (175 BCE–164 BCE). Later, Epiphaneia achieved some renown as a center where Pompey the Great settled pirates following his successful Cilician campaign in 66 BCE. It is also the proposed birthplace (among several others) of the legendary warrior Saint George. Clearly a city of some importance in the early Christian period, Epiphaneia’s bishops attended all of the important early church councils, including that at Nicaea. Although the city is largely unexcavated, the visible remains of several monumental buildings with evidence of later church construction, a theatre, a bathhouse, an aqueduct, and many houses were documented by our survey. Fig. 8: Satellite image of modern İskenderun and surveyed archaeological remains indicated in red. The location of Alexandreia kat’Isson (map), founded following Alexander the Great’s victory at the nearby battle at Issos (333 BCE), has been a topic of scholarly debate for well over a century. Our survey has definitively identified classical Alexandreia kat’Isson on Esen Tepe, a hill in the modern suburb of Çankaya within the city limits of İskenderun. Situated at the base of the historic Belen Pass that connected Cilicia, northern Syrian and Mesopotamia with the Mediterranean coast, Alexandreia kat’Isson quickly developed into a major urban center. Our survey has revealed a highly developed hinterland that included agricultural villages and towns, including evidence of several Byzantine-period churches, stone quarries, cemeteries, and technologically advanced water systems and aqueducts. Fig. 10: Satellite image of modern Arsuz and surveyed archaeological remains indicated in red. A titular bishopric in the former Roman province of Cilicia Secunda, Rhosos (map) served as a seaport located southwest of Alexandreia kat’Isson. Rhosos is mentioned by Strabo, Ptolemy, Pliny the Elder, and Stephanus Byzantius, and later by Hierocles and George of Cyprus. Towards 200 CE, Serapion of Antioch composed a treatise on the Gospel of Peter for the faithful of Rhosos. Theodore of Mopsuestia relates the history of the hermit Theodosius of Antioch, founder of a monastery in the mountain near Rhosos. According to our data collected during field survey work, Byzantine-period Rhosos was a major urban center with a well-developed hinterland that included agricultural and industrial installations, ancient mining tunnels, a sophisticated system of aqueducts, and numerous rural settlements. A noteworthy number of artifacts and architectural fragments decorated with Christian symbols were documented during our survey of Byzantine period villages associated with the hinterland of Rhosos. Our analysis of archaeological survey data from the eastern plains of Cilicia (Bay of Iskenderun) demonstrates that settlement pre-dating the Hellenistic period remained static and likely represents a landscape at the periphery of great empires. Beginning in the Hellenistic period and continuing through the 7th century CE, this region flourished, no doubt as a result of its incorporation into the imperial spheres of the Roman and Byzantine empires. This period of prosperity and population growth that characterized the Hellenistic-Byzantine periods in Cilicia would not be replicated until the 20th century. I take this opportunity to express the project’s sincere thanks and gratitude to Dumbarton Oaks for the generous assistance extended to our study of Byzantine-period settlement patterns in the Bay of İskenderun.